Please enjoy this “hands on” Aicok Juicer review, and juice to your hearts content. In our attempt to get healthier we have chosen to review the various juicers available to buy. 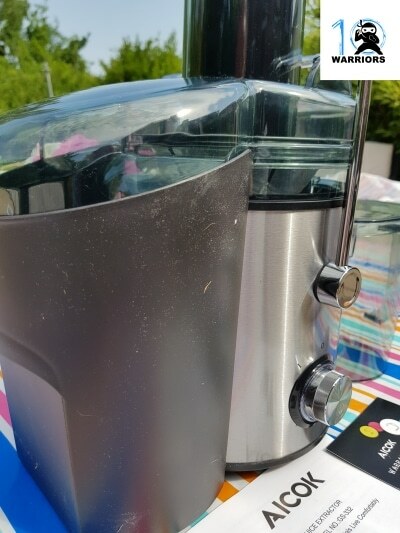 We purchased this Aicok juice extractor as we had found it to be a brilliant AFFORDABLE juicer for anyone looking to get into juicing for the first time. Everywhere we looked people were saying brilliant things about this juicer so we just HAD to see what the fuss was all about. It might just be the best juicer money can buy, so please enjoy our hands on Aicok juicer review! (For the health nuts out there (like us), we have also conducted an in-depth review of air fryers, and we also did an in-depth review of the Duronic air fryer which you can read and watch here). So, in this review we have our write up but we also have two videos for you to watch. One is an unboxing video, while the second video shows where we actually put it to use and make some juices! You can buy this brilliant budget juicer right here on Amazon. More and more people are aware of the need to be healthier. More and more people are left feeling tired and lethargic all day long (even after a good sleep). As a nation we are slowly getting more and more overweight, and something needs to be done about it. Everyone knows that we need to consume more and more fruits and veggies, yet not many of us do. Instead we’ve become used to eating less, and consuming more and more salt-laden processed food and junk food and less of the stuff that actually makes us feel full of energy. As a side note, there are very genuine stories online that are helping prove the link between various health issues (and even Cancer) and junk processed food (and also meat). So it makes sense to try and at least change our eating habits to some degree. This was a short film I watched online a few weeks back about a guy called Joe Cross who had health issues that had crept up on him, and had enjoyed a high profile life along with some very unhealthy eating and drinking habits. He turned his life around all through juicing and lost an incredible amount of weight, and got his life back. I thoroughly recommend you take some time to watch the free film that’s almost 1 hour 40 minutes long. You can watch it here: https://www.rebootwithjoe.com/watch-fat-sick-and-nearly-dead/ (opens in a new tab) (please comment on this post if the video gets taken down). From that film he has now produced numerous books to help people get the same success. I thoroughly recommend you get this book or any of his other books to compliment your juicing journey. You can grab the “Reboot with Joe” book right here on Amazon. When you juice regularly you are flooding your body with loads of vitamins and minerals. In literally days people are noticing clearer skin and more mental alertness just from juicing. You couldn’t physically eat the large number of fruits and veggies in a single sitting to get all the goodness, but you can drink the juice in a few glasses and reap the benefits! So let’s take a closer look at this particular juicer. The blade is made from tough stainless steel. It is inexpensive(click here to get it on Amazon)! It lets you enjoy juicing without breaking the bank. It has 2 power modes. 1 is a lower speed and great for softer foods, while the 2nd is for harder foods but runs at higher speeds. This will help the motor life last longer than if it was just running at high-speed all the time. We didn’t know till after we had bought this juicer that you have to exercise care not to over use the juicer. They recommend you juice for no more than 1 minute then let it rest for 2 minutes before re-using the juicer. You can do this 3 times but must then let it rest for 15 minutes in order to protect the motor from burning out. In practice it’s not really an issue as you are usually done juicing a good jug full in under a minute. While the veggie juice was enjoyable and easy to clean the parts after, the fruit version stained the plastic jug with the Oranges we used. See picture below. It will need a good soak with hot water and soap first, whereas other foods can be rinsed off. Using Oranges stained the jug, so won’t simply rinse off. Watch as we create 2 separate juices using the Aicok Juicer. Takes seconds to create! There are now hundreds if not thousands of recipes you can create with your juicer. There are Green tea juices, detox juices, hangover juices, vitamin punch juices, and yes if you can think of it, there will be one made for it. So there you have it. A great entry level Juice extractor that looks 4 times as expensive as it really is. Treat it with care and clean it well after each use, and don’t over use it for more than a minute at a time and you’ll be using it for months and years to come! Ready to buy this juicer? Go grab it here direct from the Amazon website.